The Giant Malay Leaf Insect has fascinated me for over 40 years. Sadly, I found that the eggs hatch easily enough but getting the nymphs to eat was an entirely different story! On many occasions I fussed and fretted over newly hatched nymphs - kept in plastic boxes - which would briefly nibble a leaf, stop and eventually die of starvation. After years of failure, someone advised me to replace the plastic boxes with net-sided cages. The difference was remarkable. 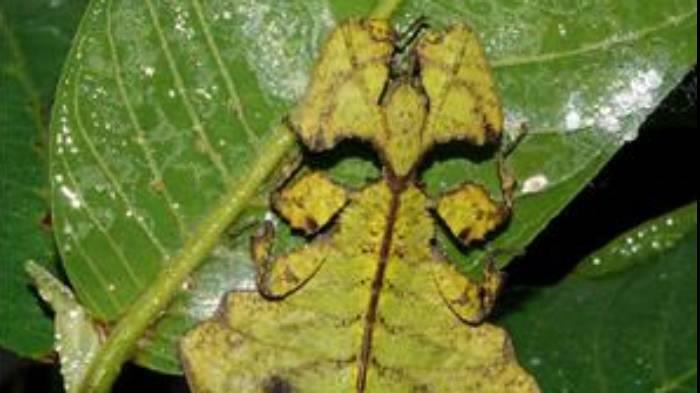 All leaf insects rely on superb camouflage as their only defence against predators. If the air is still but the insect moves, its cover is blown. In a plastic box the air is always still, so the insect remains immobile to avoid detection until it starves. No one said they were clever. When the leaves started moving even slightly, the small red nymphs wobbled along the leaf edges and began to feed. There may be people who have succeeded with plastic boxes, but I am not one of them. Clipping the edges of the leaves also helps, as does having other leaf insects already feeding in the cage. Once I realised the importance of ventilation, I was able to rear Giant Malay Leaf Insects without problems in the UK, then South Africa and now in Malaysia. Seeing these insects in the wild here is a dream come true. 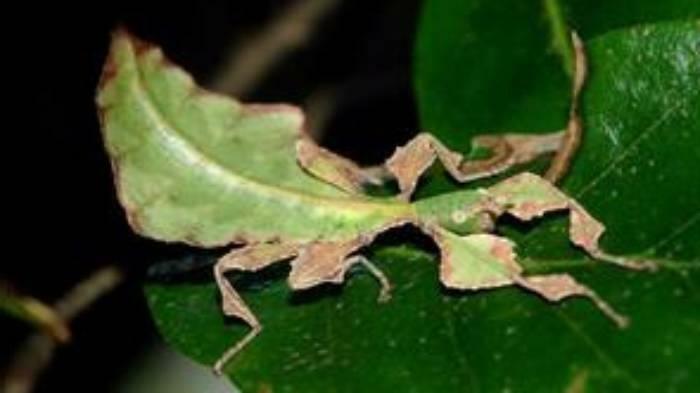 Even with access to wild specimens from dozens of orang asli (aborigine) insect collectors in the Cameron Highlands over four years, I have only seen one male Giant Malay Leaf Insect. Males are extremely rare and almost never seen in captivity. As far as I am aware, all the stock in captivity today is from unmated females, through parthenogenesis. 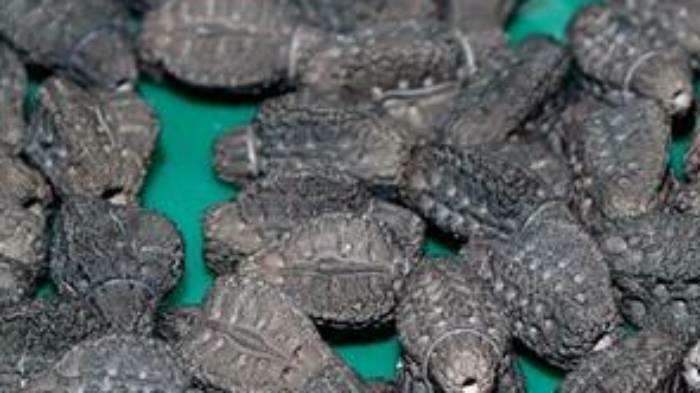 The eggs are dropped on the floor of the cage and take between 5 and 7 months to hatch. The newly hatched nymphs are dull red in colour but after a short time feeding they turn green. 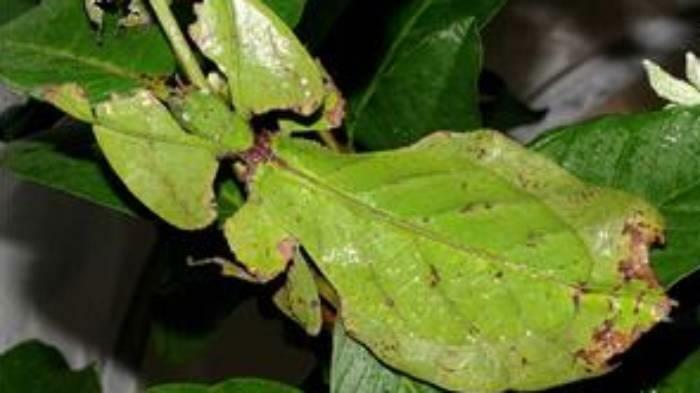 These leaf insects feed on a range of plants, including guava, mango, oak, bramble and rose. The nymphs take roughly five months to reach maturity depending on the temperature, which should be around 80°F but a few degrees higher or lower doesn’t matter. A well-ventilated cage is necessary, and I lightly sprayed the leaf insects once a day. Adult females have short wings and vary in colour from light to dark green. Some have chocolate markings at the end of the abdomen or white speckling but others are just green. The outstanding feature of this insect is that they really do resemble leaves. Not just their flattened 4 ½" long body, but their legs and wings are also excellent copies of leaves. What makes the camouflage so amazing is that some of the ‘leaves’ look like they have been nibbled. Visitors often stare into the cages unable to see them, even when the leaf insects are literally inches from their faces. This is one of my favourite phasmids. If you can get the nymphs to feed, they are easy to rear and, as there is no breeding involved, it is simple to get eggs. 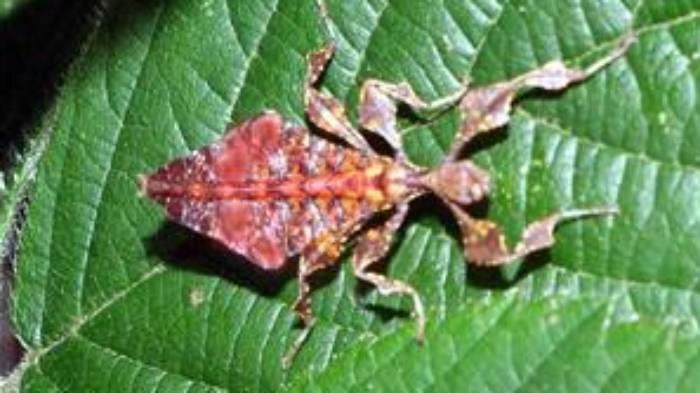 This is a bizarre insect that deserves to be better known.